U.S. Buildings' Metal Buildings for Auto Repair are both durable and reliabe, hassle free! Have you always dreamed of having an auto body or repair shop? We can help make your dream a reality. U.S. Buildings has an array of customizable metal building designs that can meet all of your auto maintenance needs. 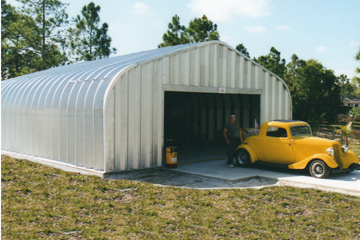 You can rest easy knowing your customer’s vehicles are safe and secured in one of our prefabricated steel buildings. U.S. Buildings auto body and repair shops can be fully customized to your liking with doors, insulation and more. Our clear-span interiors can be built up to 200 feet wide with unlimited lengths and feature column free construction so you can move your vehicles around with ease. All of our steel auto repair buildings are made in the USA of the highest quality galvalume steel. Our buildings are easily assembled, virtually maintenance-free and strong enough to withstand the most extreme weather elements. Our special arch type design allows for future additions to be added on at any time, so your building can grow with your business. Call us now and let us assist you in building the perfect structure that fits your budget. Why Do People Choose U.S Buildings’ steel buildings? Call U.S. Buildings now toll-free at 800-222-6335 to speak with one of our steel building specialists. Be sure to ask about our monthly money saving building specials that could save you up to 60% off your steel structure. Just give us the dimensions of your building projects and we’ll provide you with great options, a competitive price and a building that you’ll be proud to show off. Call us now!